Today is an auspicious day for the blog. It is the day It the anniversary of this blog. Around this time last year, I have decided to shift all by my blog entries from Tumblr to WordPress and the transfer process have messed up my date of entries. Therefore, I have chosen today to be my blog anniversary. The actual date should not be 7 days more than this date. I have no intention to celebrate this special day, no giveaways and etc. 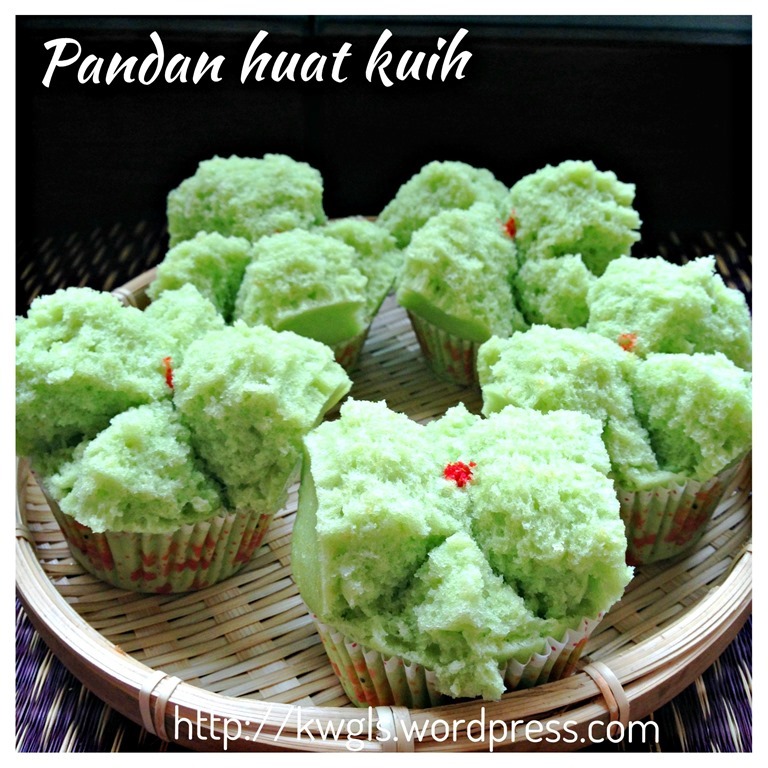 Instead, I have prepared a type of “huat Kuih” or “Fa Gow” to commemorate this day. 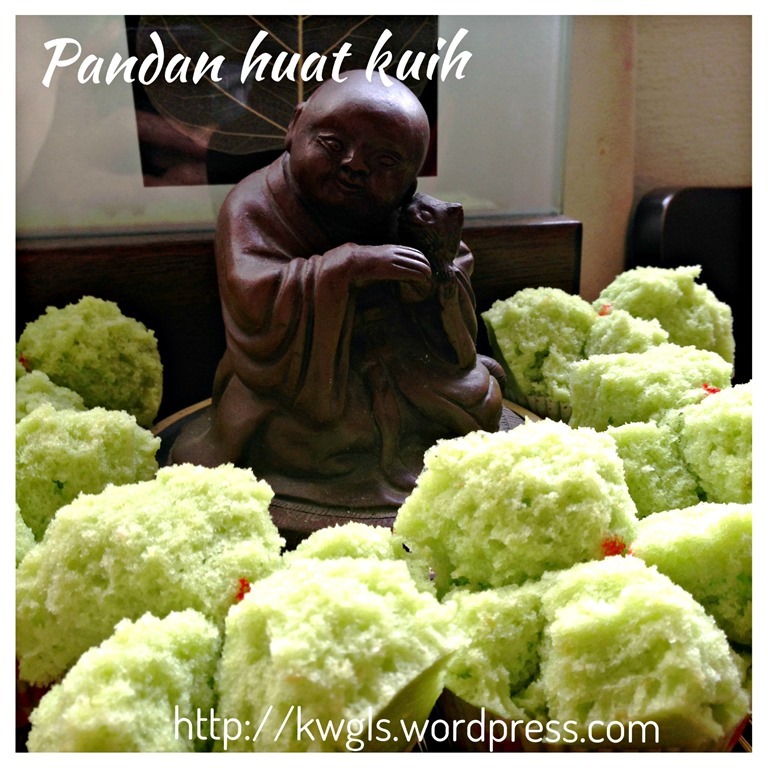 Why Huat Kuih or Fa Gow? 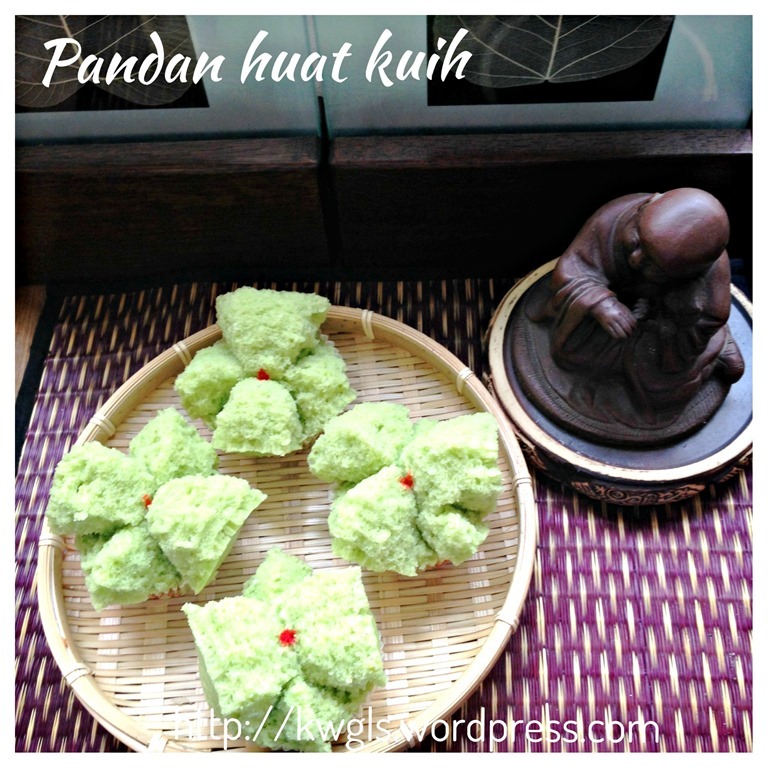 Actually, for the last blogging year, my first post of Huat Kuih prepared using rice flour have attracted a lot of readerships… and I will share my top 20 posts of my last blogging year in a day of two. 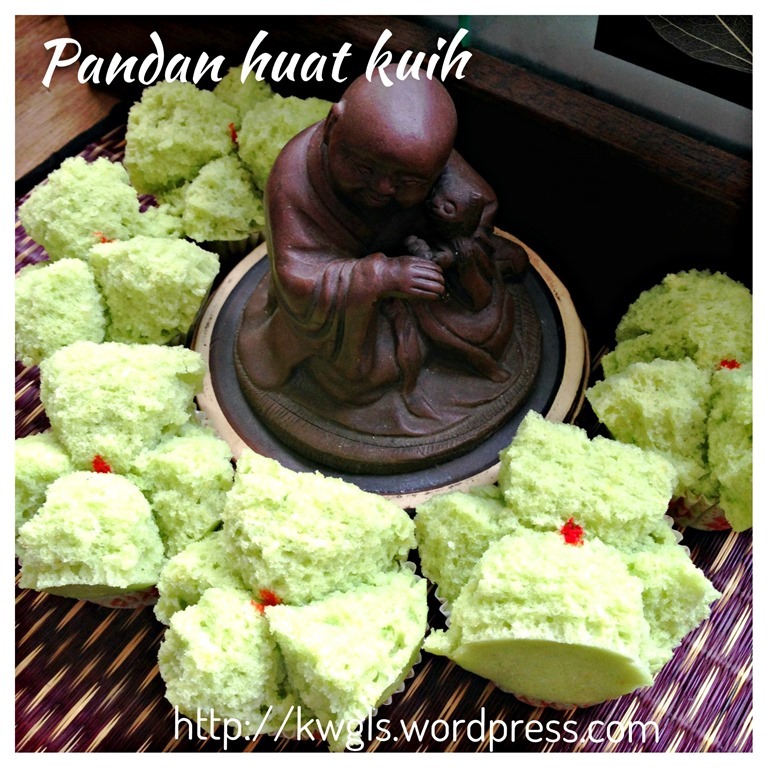 As contrasted to the Huat Kuih post that I issued last year, this Huat Kuih is prepared using wheat flour and not rice flour. 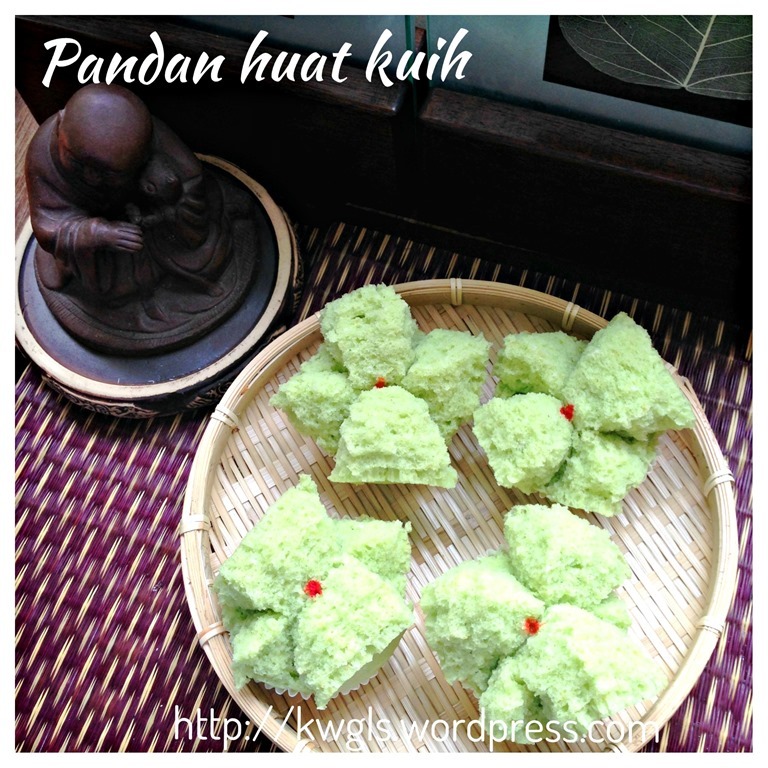 There are many versions of huat kuih in the internet and I thought it might be good for me to try a Huat Kuih prepared using normal flour. When I goggled for the recipe, I stumbled across this simple recipe : 香味扑鼻的班兰小发糕. I looked at the picture and it really attracted me. So I have decided to prepare this today hopefully it will bring some luck to me in my second year of blogging. I am very pleased with this cake. It is definitely edible. It had eggs and butter in the ingredients and it is a very fragrant cake. However, for religion praying purposes, you will have to decide whether it fits your praying criteria since eggs and butter were used. 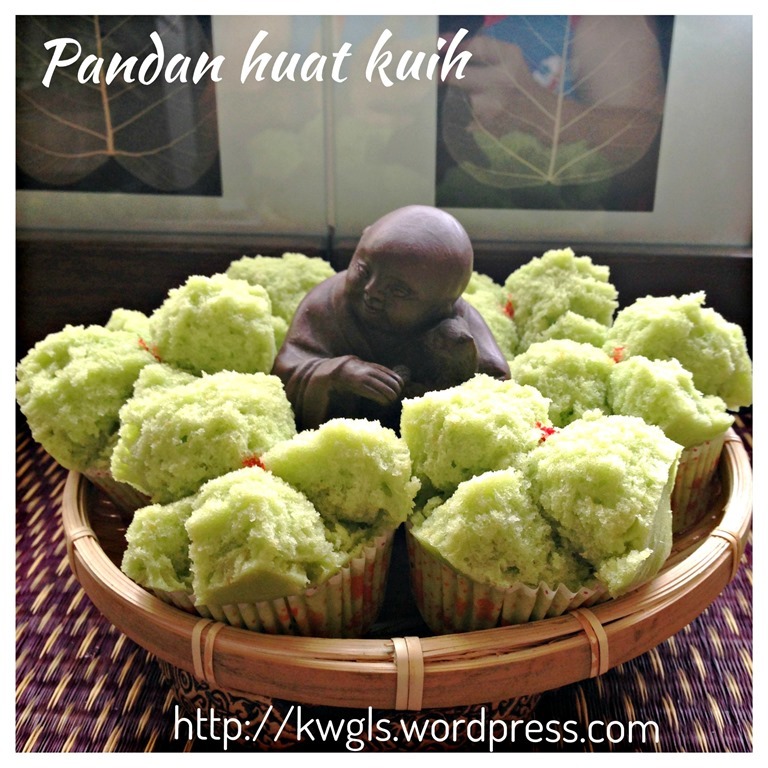 If you would like to read more about the history of Huat Kuih, you can refer to my first post. 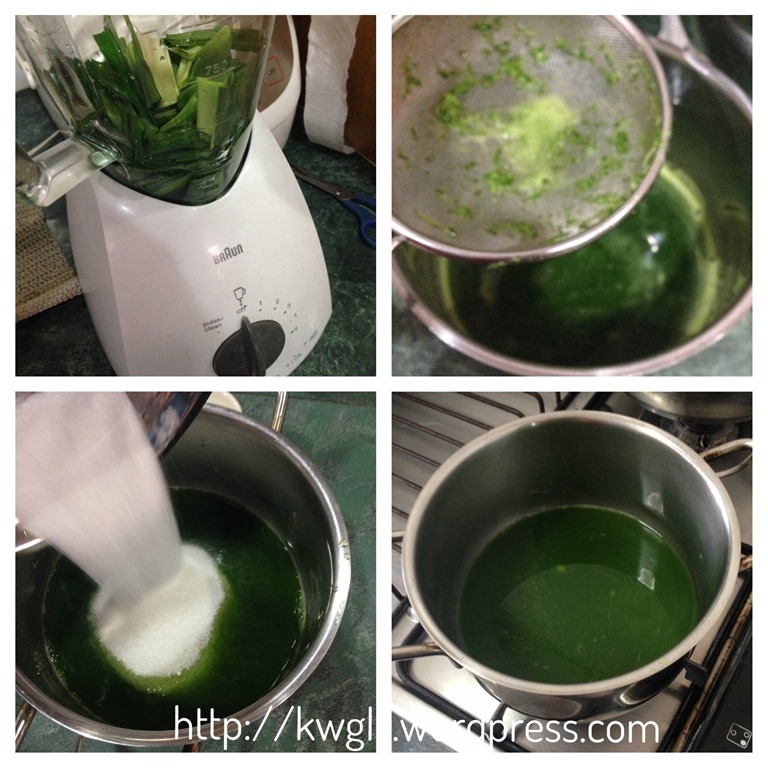 Blend the pandan leaves with the water. 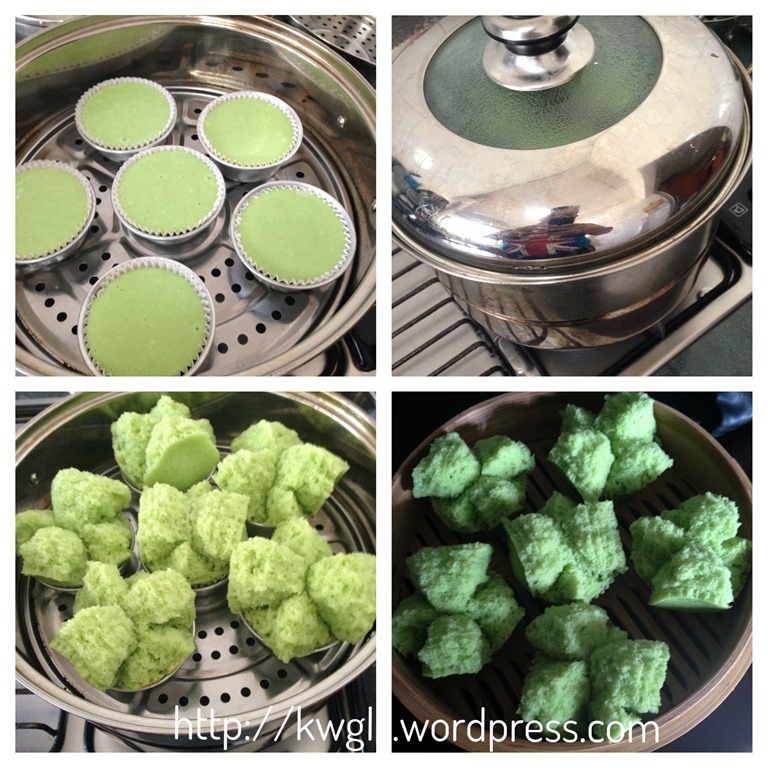 Sieve the pandan juice to a pan. Pour in the sugar. 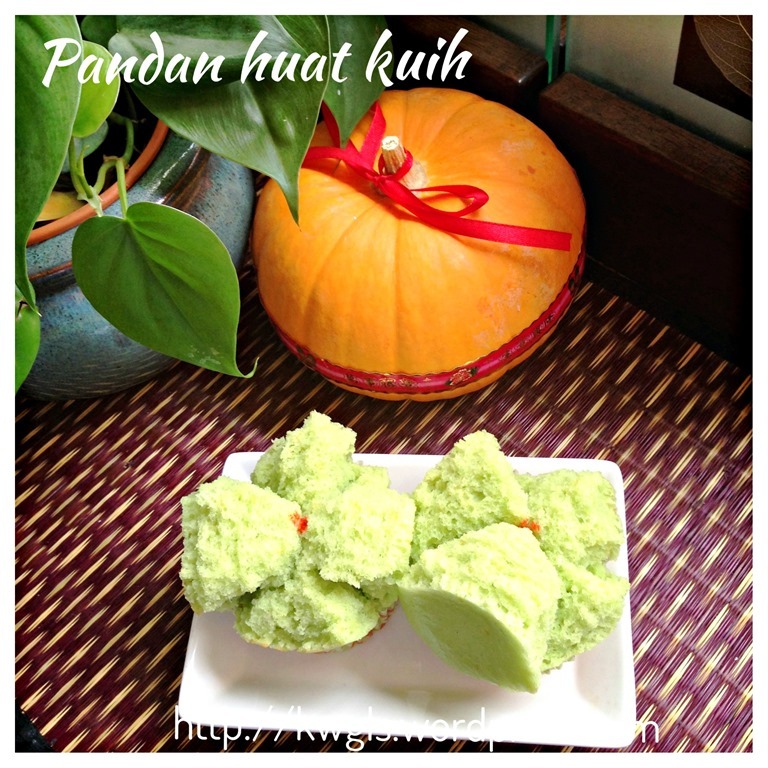 Heat the pandan juice and sugar until all the sugar have dissolved. There is no need to bring the juices to boiling point. As long as the sugar have dissolved, off the heat and set aside the pandan syrup for later use. Heat up the butter in a microwave for about 30 seconds. When cool, add in the eggs and stir lightly until well combined. Set aside.. In another big mixing bowl, sift the self raising flour and double acting baking powder. Make a well in the centre. Add the Pandan juice followed by the egg butter mixture. Use a hand mixer and whisk until well mixed. Transfer it to some cupcake cups and fill the cups with the batter until at least 95% full. Steam in the steamer for 15-20 minutes or until a skewer inserted in the centre come out clean. 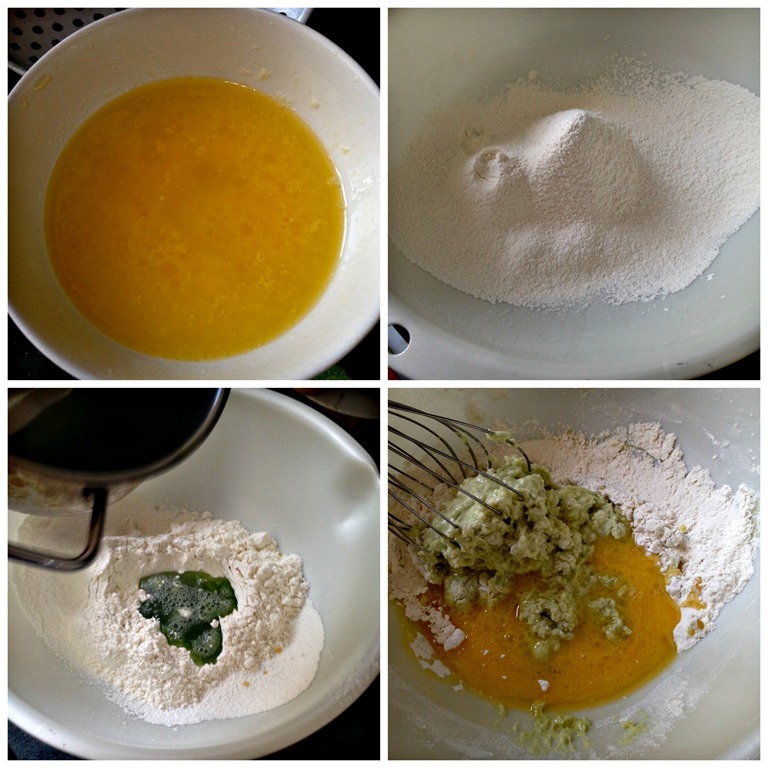 It is best that the cupcakes cups be pre-steamed before filling of the batter. You shall use high heat in the entire process of steaming. Best served hot as a snack . I am very happy as the cakes turns out very well, “laughing” happily in the steamer. Not only that the cakes are pretty, the cakes are extremely tasty. It is a blend of pandan, egg and buttery aroma. In addition, it is soft and fluffy. Hopefully, this will mark an auspicious start for the second year of blogging career. 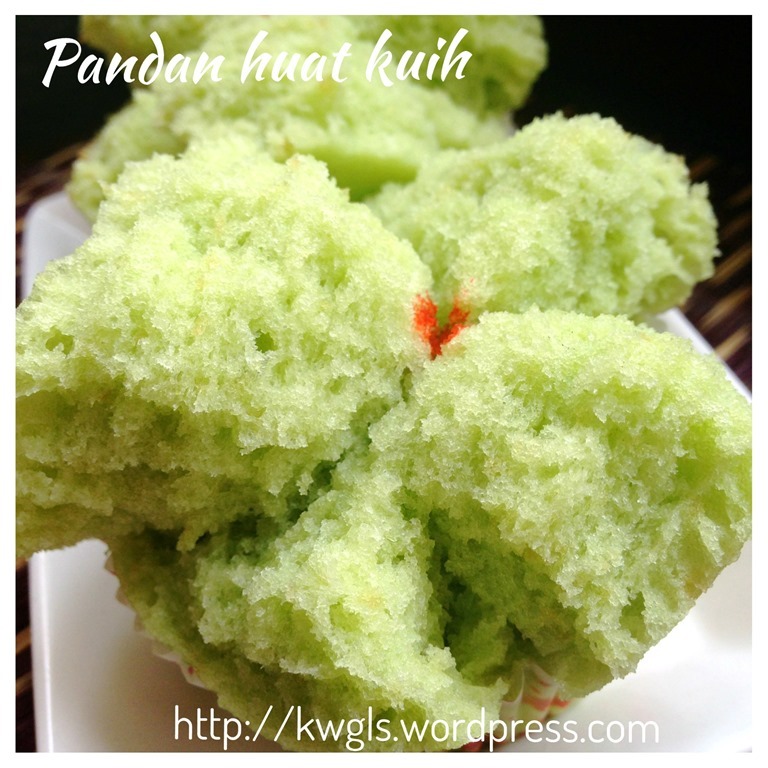 This entry was posted in Cakes and cookies, Chinese and Asian Cakes and Snacks, Food Preparation Series and tagged 8, 班兰发糕, 香兰发糕, GUAI SHU SHU, Guaishushu, Huat Kueh, kenneth goh, Pandan Huat Kuih, Pandanus Huat Kueh, postaday, 发糕. Bookmark the permalink. Happy Birthday! 🙂 Keep up the great work. Happy 1st anniversay to your blog! 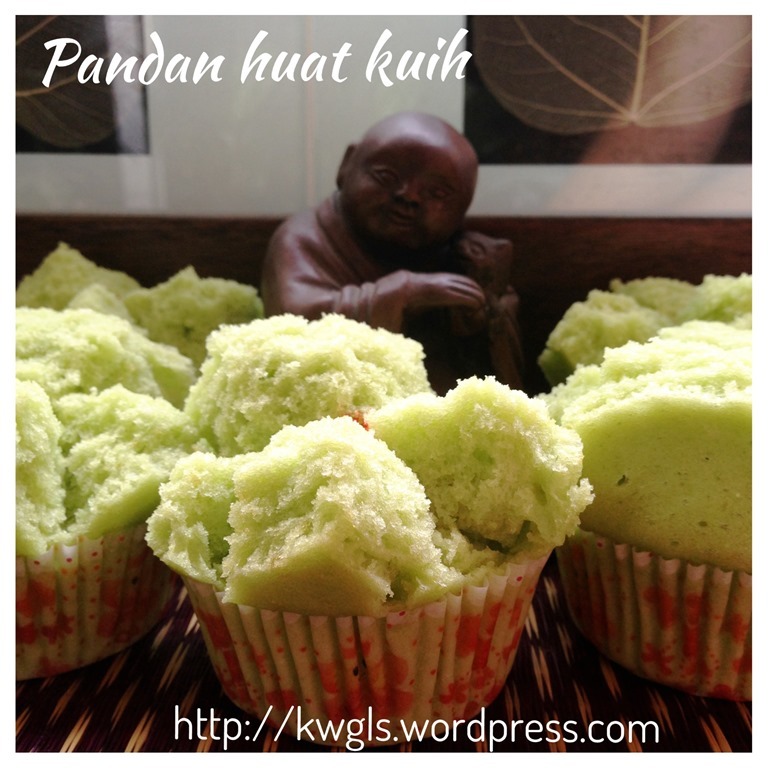 Your huat kuih has HUAT very beautifully! I shall try it one day! Thank you very much. Pandanus or screwpines is optional. You may have tried it in the Thai restaurant where certain chicken pieces were wrapped in a piece of aromatic leaf. It provide a very nice aroma. 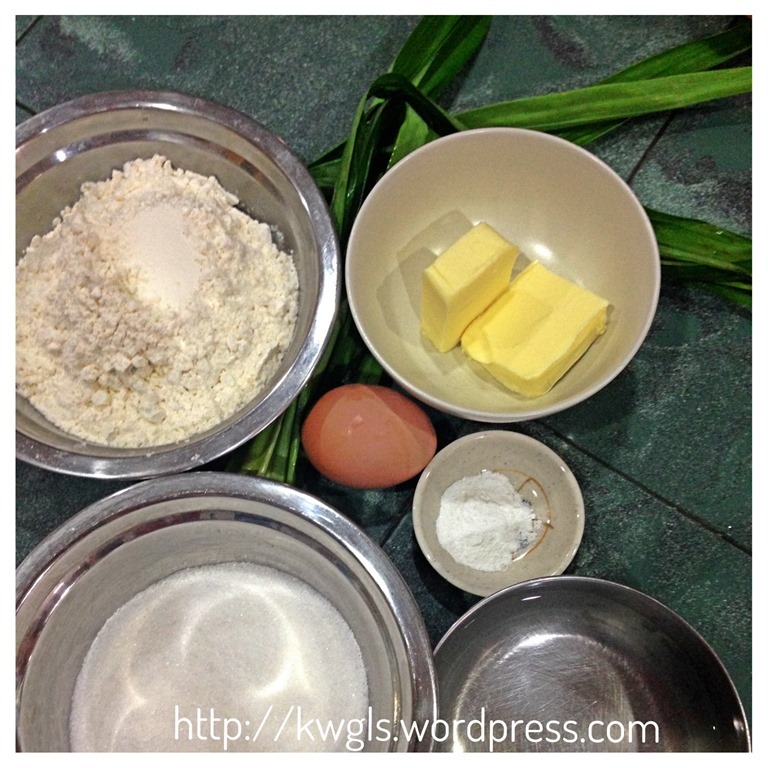 What is the difference in Huay kueh when recipe calls for sweet potatoes compared to recipes without sweet potatoes? 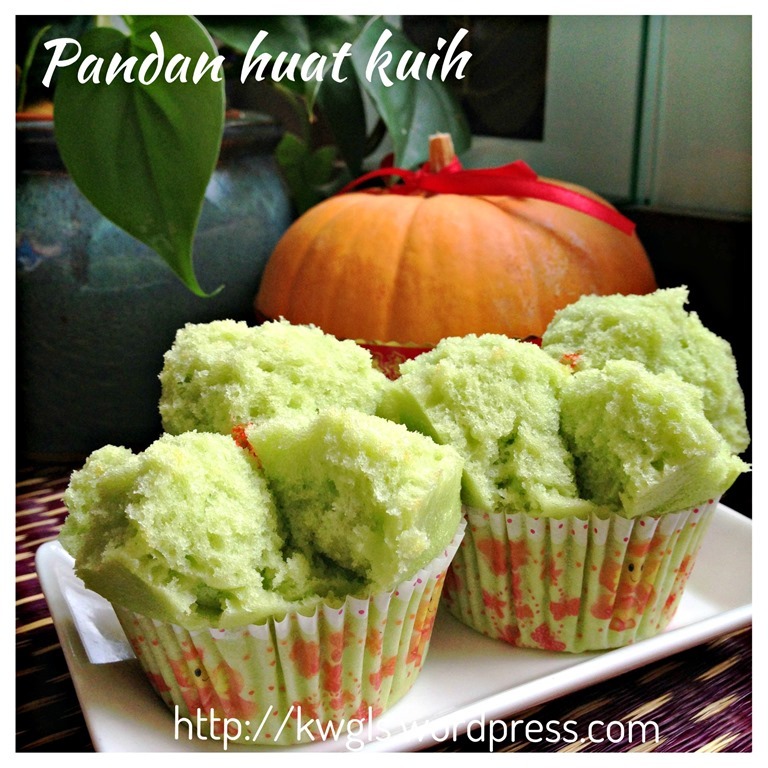 Will use pandan paste since I can never find pandan leaves in America. Tks again. The 200ml is for pandan juice? 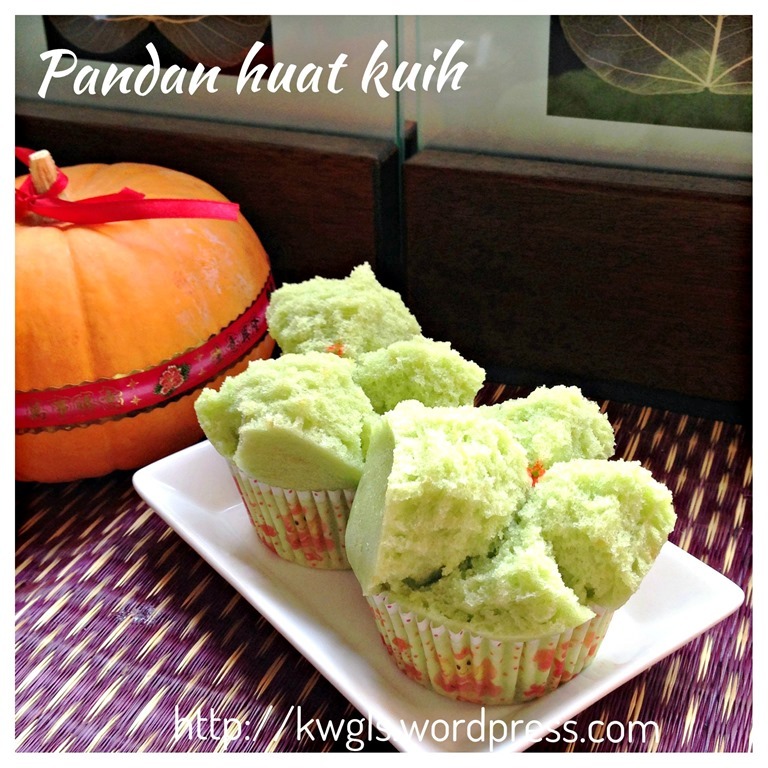 If I want to use pandan paste, what can replace with? Why some of the Huat Kueh I made are not open/huat nicely ? They look like wearing a round hat and not splitting nicely like yours. When I first came to your blog, you seem so experienced that I thought you’d been blogging for a few years at least. Great job! Looking forward to more recipes and baking/cooking tips! I noticed that in the Gula Apong Huat Kueh recipe, you cut it before steaming but not in this recipe, is there any special reason for that? Hi, I would like to ask if i use other flavouring eg. Orange juice, do i replace the 200ml water to 200ml orange juice? You can try but I have never try before. Tried n failed. ..cannot huat like yours..taste rubberly ….got to throw them away..
Can I reduce the sugar to 100gm? Thanks. Sifu Kenneth, what is the size (diameter) of the cup? I made these cupcakes and they are perfect. However, I would like to know if I can replace the 200ml juice with 200ml coconut milk? And for the butter, can I use vegetable oil? As I’m trying to remove the butter scent. And what happens if I use one more egg as I’m trying to make the huat kueh have a stronger egg fragrance and slightly denser type like those sold outside where the egg scent is stronger, sweeter and have a melt in mouth feeling. Thank you..Sifu Kenneth Goh. 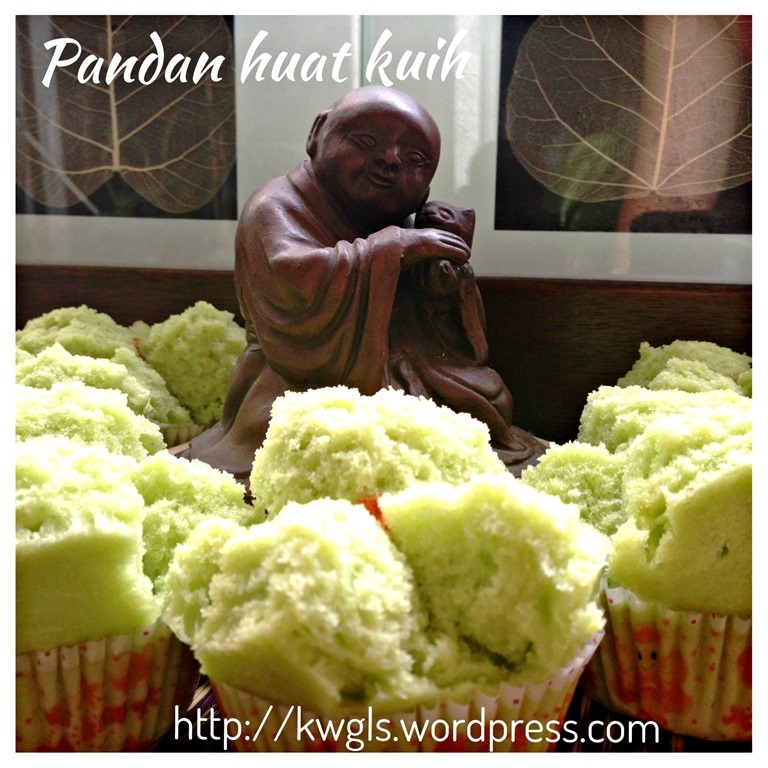 Today i try your Panda huat kuih. Super easy…super fast…very nice. Thank you.